After two years of importing Jean-Claude Credoz’s wines, Ted was excited to finally meet the vigneron at his eponymous domaine. One of The Source’s collaborators, Jérôme Brenot, made the introduction between Ted and Credoz, one of the preeminent producers in Château-Chalon, an AOC with some unusual and strict requirements. 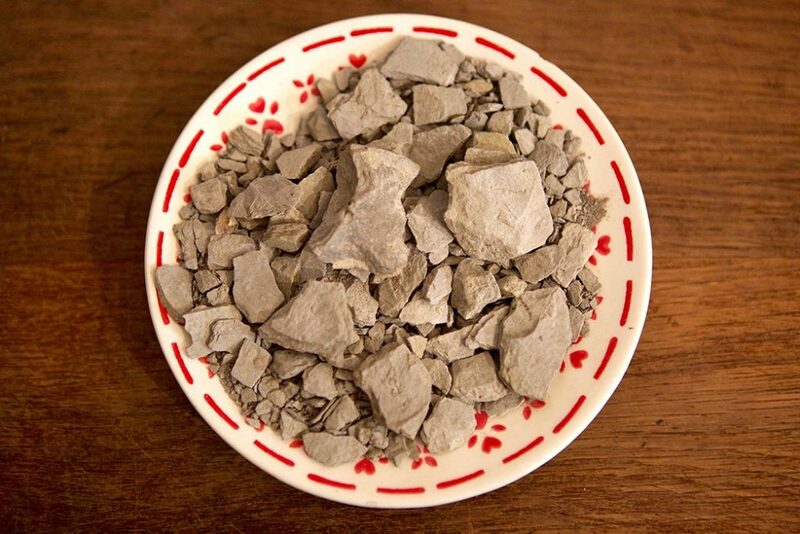 While the Jura region grows a lot of Chardonnay and other grapes, only Savagnin (somewhat similar to chardonnay, or a Chenin Blanc from France’s Loire Valley) may be used to make white wines in the distinctive style called Vin Jaune, or “yellow wine,” of Château-Chalon. Credoz makes other styles, but it was this one with the unique rules that I was really looking forward to trying. On Ted’s first time to the Jura a number of years ago, he was there to visit the legendary domaines, Jacques Puffeney and Domaine de Montbourgeau, both of whom are imported by one of the very best importers of French wine, Neal Rosenthal. Ted told me that Jacques was a friendly man who spoke no English but was kind and listened earnestly to what Ted called his then infantile French. Jacques has since retired and though he made white wines when he was still producing, he was most known for his Poulsard and Trousseau red wines as well as his Vin Jaune. Ted said that when Jacques moved on, he sold his vineyards to a famous producer from one of Burgundy’s greatest villages and domaines, Domaine Marquis d’Angerville, from Volnay, and it kicked up quite the controversy. The new owners came in and started making their wines “cleaner” and more “Burgundian,” and since the Jura locals pride themselves on their eccentric style, rumor had it that they were pretty unhappy about the changes. But after just a few vintages the wines began to show authenticity and a different kind of purity; it began to hold its own as a vin de Jura and not an imposter from another AOC. We rolled over gentle hills and passed many more shocks of yellow canola and dense woods of thin, straight and still naked trees, which made it feel like we were driving through a giant hairbrush. The occasional field full of grazing beige cows flew by, along with many signs for unseen chicken farms. Andrea fielded business emails from the front passenger seat, occasionally checking in with Ted for answers that could only come from him. It seemed like Ted, she also worked nonstop the entire trip, always on her phone or laptop, emailing and maintaining the graphics and layout of The Source’s website. She also helped Ted navigate through the often-frustrating French roads that sometimes stymied Waze and the car’s navi, and merely smiled when he cursed about getting off track. Before we entered the Saone Valley, between the Côte-d’Or and the Jura, the land around us flattened out, and Ted said we had just dropped in altitude. He added that we had entered an expanse where the movement of the Alps had pulled the earth apart between Burgundy and the Jura, creating this depression. The many rivers and glacial migrations in the area had denigrated the stones into sediment, leaving the mother rock many meters below the surface and the soil above deep and fertile. Meadows in every direction were vibrant with green spring grasses, chock full of rich nutrients, a time when local cows make the best milk of the year. We soon passed close to the commune of Arbois, known for its dairy production and the place where Louis Pasteur grew up. Arbois is in the Bourgogne-Franche-Comté region, where Comté, a distinctive and ironically unpasteurized cow’s milk cheese is made. Though the French pasteurize most of their milk for grocery stores where it often sits on shelves without refrigeration, they don’t subject any of the milk in their domestic cheeses to this process of heating to kill bacteria (the US more widely adopted Pasteur’s innovation). The people of the Jura are convinced that these locally produced goods are the best compliments to the local wines due to their shared terroir, and it makes sense that the flora and fauna grown in an area would take on similar attributes. The same is thought about products all around France, and any local across the country will attest to this sense of continuity, with pride. He added that since he has graduated to such abstract thoughts and analyses, he’s grateful to sometimes work with Jordan McKay, a highly accomplished and eloquent food and wine writer who often contributes his own material to Inside Source, The Source’s webpage blog. Ted feels that Jordan helps to keep him grounded, to keep his explorations of wine accessible. Jordan is one of the few with whom he can go deep on abstract “wine talk. He understands where Ted’s coming from and supports him in clarifying his ideas and theories. 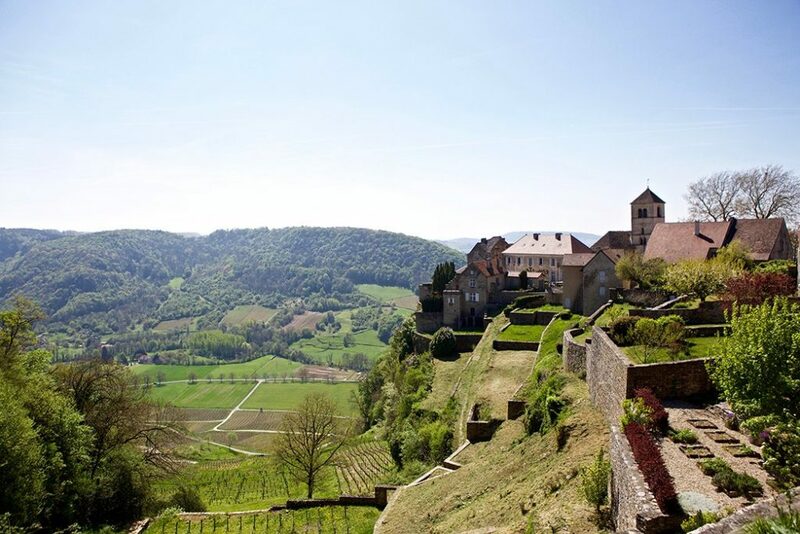 As we began to wend our way up into the Jura Mountains, we passed parcels of vines on the slopes beside the road to our right, and had a great view of many hectares on a hillside bowl across a small valley. It was all a patchwork of green and beige (many with tinges of orange) in every geometrical shape. While many plots looked healthy, with modest undergrowth and brown soil, some (including those just a few feet from our car) had vivid orange weeds, signs of death by herbicides. Still others were overgrown and a little too green, a sure sign of artificial fertilizers. Ted pointed out the many examples of these and shook his head.